I was watching an episode of my favorite show; "Duck dynasty", in which Phil said: "Lookie here, you got police lights, people pulled over, here, when your in trouble, you call 911. Where I'm at, I am 911." That statement got me thinking, I live a few miles out of town, how fast would the police respond in an emergency? So I did a little bit of looking and here is what I found. First off, to be fair, the police do a wonderful job given the tools they have. Unfortunately they can not be in every place at the right time. They are spread out, approximately 1 officer to every 400 citizens. It simply takes time to get from point A to point B. This isn't a bash against police, it's simply a fact, you need to consider yourself the first line of defense because law enforcement simply can't be there when you want them to be. It takes time. The Detroit Police Department reported an average response time to priority 911 calls fell 28%, from 34 minutes to 24. The average response time to non-priority calls decreased about 6%, from 55 minutes to 52, in the same period. So, if you live in Detroit and someone is robbing your home, you can expect the police to be there in 24 minutes. Really??? how is that response time even possible? Has anyone ever thought maybe the cops not showing up is a reason for crime in Detroit? In New York, response times to priority 911 calls have increased from 7 minutes to over 8 minutes. LAPD officers have taken an average of 5.7 minutes to respond to emergencies this year -- an improvement over last year's 6.2 minutes. Even with budget cuts, these guys are faster than any metro location I have information for. In Minneapolis, an average response time of 8 minutes 13 seconds for the highest-priority calls. In Atlanta it took, on average, 11 minutes and 12 seconds from the time a high-priority 911 call was received until an Atlanta police officer showed up at the scene. The response times reported by the El Paso (Texas) Police Department was an average of 11 minutes and 11 seconds. The Denver Police Department posted a response time of 11 minutes flat. Tucson, Ariz., responded, on average, in 10 minutes and 11 seconds. Police in Kansas City, Mo., and Oklahoma City posted average response times of less than 10 minutes. In Nashville-Davidson County, police recorded average response times below 9 minutes. These are larger urban environments, it was much more difficult to find data on rural response times. The Justice Department says the best response time is approximately 4 minutes and can extend up to 1 hour or more in some rural communities. The bottom line is this: Phil's right, you are 911. Now, here is where things get interesting: the average interaction time between a criminal and his victim is 90 seconds. That translates to you being robbed/injured/maimed/raped/murdered and waiting for an additional 2 and a half minutes for the police to arrive. The truth of the matter is that the police will almost always arrive AFTER the crime has happened and the criminal has gone. The police almost never stop crimes while in progress, they rely on solving crimes after they happen to deter future crimes from happening. The reality is that you are on your own for at least 4 minutes or more after the call. 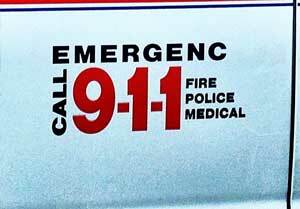 Now, the question is, are you prepared to be 911 when necessary? You don't have to go all "Doomsday Prepper" on the matter, but think about what you can control. 1. Entry points - ensure the shrubbery and obstacles are trimmed and clear so your entries are visible with no easy hiding places for someone to ambush you. 2. Windows - make sure the ground level windows are locked. 3. Locks - make sure you keep it locked up when your not around. Dead bolts are necessary. 4. Garage - make sure the secondary door to the garage is locked if it is attached to the home. A common mistake, the garage is closed, the house is locked up but the garage door opener is in the open car. Lock the door from the garage to the house at night. 5. Security System - if you have one, use it. If you don't, consider it. You're still going to deal with resonse times issues, but it's a good deterrent and it leaves you free to do other things besides dialing 911 and convincing the operator your call is a priority. 6. Dog - There really isn't a better security system than the good old dog. He's not only a good warning system, but he's a strong deterrent. Many criminal minds won't even consider your home a target if they know you have a dog. My dog Chester keeps the Coyotes at bay and takes on the neighborhood Skunk when he needs to. 7. Weapons- personally I believe in having a weapon on hand to defend you and your family if the need arises. Where I'm at I wouldn't expect police to show up for at least 15 minutes. That makes having a weapon important. Make good choices, be safe and train the appropriate people on the handling and use of the weapon of choice. By far, the greatest weapon you can invest in for home protection is a good shotgun. Simple to use, very intimidating, extremely effective if used. I like to alternate my shot, I load buck shot and slugs alternating. This gives me a wide "hit box" along with extreme stopping power. We all need to think about these things as we consider the: "What ifs", of life. Don't be a victim. Spend some time thinking of how your home can stop crime before it starts. What are you willing to do to protect your family? Just as important, what is your significant other willing to do to protect your family? It is important to know and important to show them how. A shotgun for home defense doesn't make sense if your gone and nobody else knows how to use it. Thanks to Damian Gadal for the use of the photo.